Who's coming to Slam The Dam? The Aussies! No swimming event in the world would be complete without a bunch of competitive Australians on the starting line, and this year’s event will be no different. All the way from Perth, Western Australia, three guys are making a trip to the USA to swim in New York, Las Vegas, San Francisco and hopefully, Los Angeles. Jon Haines, Shaun Jessop and Mark Williamson are making the 24,132 mile round trip, simply because they've never done it before - and can't wait to swim somewhere new! Although all three have visited New York at least once in their lives, the idea started as a group trip to the Big Apple, and almost immediately turned to asking "New York is a long way to travel for one swim - where else can we go?" Straight away the opportunity to swim in Las Vegas' Slam the Dam was found a week after New York's Little Red Lighthouse swim. Once a few emails had been swapped between Australia and the USA, the trip was definitely on! Adding San Francisco and Los Angeles was simply a case of "we are flying over those cities to get home to Australia, so let's drop in and make the most of our trip!" 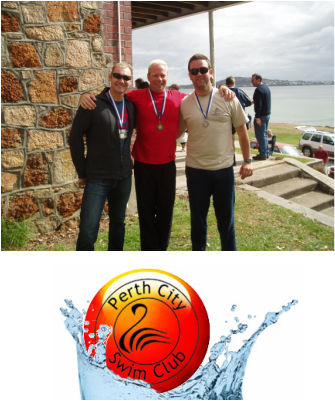 All three swimmers are members of Perth City Swim Club, and as Club President, Jon mused, "Our club has members from all over the world, including many ex-pats from the USA and Europe, who have either emigrated to Perth, or who are working there with multi-national companies. Perth has booming mining, oil and gas industries, so we always have Americans in our squad training sessions. So let’s meet some more on their home turf!" Shaun Jessop, an immigrant to Australia himself from the United Kingdom, and now an Australian citizen added, "At out last social event over coffee we realized we had 17 people at the table, and each one had come from a different country!" Jon was born in London and moved around southern England, before his love of music drove him to work at what was then the world’s biggest record store, HMV Records in Oxford Street, London. After emigrating to Perth, Australia in 1986, Jon formed half of a successful Australian punk rock band - The Vomit Bags, and screamed “Susan Sneezing her Brains Out” across the great southern land on Triple J’s “Live At The Wireless”! Australia's warm climate gave Jon the opportunity to wreck his knees playing tennis, volleyball and compete in triathlons. This drove him to only play sports and swim strokes where he can keep his legs together! To improve his open water skills Jon joined Perth City Swim Club in 1999, became Treasurer in 2001 and took over as Club President in 2010. Apart from a trip to Zimbabwe in 2008 to deliver medical and school supplies, Jon uses swimming to see the world. Now a veteran of over 200 open water swims and seven solo crossings in the 20k Rottnest Channel Swim, Jon has competed in swimming events since 1999 across Australia, Italy, San Francisco, Fiji, Chicago, Canada, Denmark, Germany and New Zealand. “I have several friends who have done the Manhattan Island Marathon Swim so the Little Red Lighthouse Swim will give me a chance to understand exactly what it feels like to swim in the Hudson! The Slam The Dam Grand Slam is something different for us. To complete an 8k swim and then have to get in again for what will be a long sprint to the finish is quite thrilling. We really don’t know who will have the speed at the end!”. Shaun was born and raised in Scarborough, in the cold North-East of England, and was taught to swim as a baby by his mother, who was an established long-distance swimmer. (Shaun’s sister remains one of the youngest swimmers ever to complete the English Channel as part of a Junior Relay team). Like many people, Shaun stopped competitive swimming in his late teens, after discovering girls and fermented hops, whilst at University in Nottingham, England! After working for the US Credit Card company - Capital One, in the United Kingdom, West Virginia and Paris, France, Shaun knew he wanted to live and work in other countries and convinced his to do the same. His wife chose Vancouver, Shaun chose Australia, after watching the Sydney Olympics in 2000. Needless to say, Shaun won that argument, but has been on a losing streak ever since! After emigrating to Perth, Shaun joined a gym, which had a rooftop swimming pool, overlooking the city, which he used to cool down after weight training. After a few visits, the gym became the warm-up for the pool, and soon became a minor distraction, leading Shaun to cancel his gym membership and join a swimming club, where he met Jon and Mark. Shaun's wife secretly entered him into an open water race, because he was too scared of coming last! He didn't come last, and hasn't looked back since! Shaun recently swam in his first pool race in 24 years, and managed not to come last again - "I was absolutely petrified. My last race was in 1986, I was 15 and when I dived off the blocks, my untied bathers came down and my goggles ripped off my head. I spent the entire 200m pulling my bathers back up, and crashing into lane-ropes. I came last and vowed never to swim again!" Shaun is not a sprinter, so he focuses his energies on training for longer, Open Water Swims, which has provided him excellent reasons to explore Western Australia, and now, the USA!!! Earlier this year under the guidance of Manhattan marathon swimming veteran Shelley Taylor-Smith, Shaun completed his first of many solo Rottnest Channel Swims and is looking forward to adding some international swims to his resumé. Mark, affectionately known as ‘The Walrus’ or “Willo” to his swimming peers has been swimming with Jon and Shaun for only a couple of years, but is a natural, swimming powerhouse! Mark started swimming at age 6 in a local club learning the technique and then went on to swim competitively until aged 13. He achieved champion boy at primary (elementary) school level. He gave it up in '93 substituting for playing basketball. After a back injury in '95and subsequent operation swimming came back on the cards from early '97 as part of his recovery process. At one stage, the doctor's said he would have a 50% chance of being disabled for life! A regular at the clubs home pool complex since 2004, 2010 marked a time for Willo to take up the enjoyable challenge of joining Perth City Swim Club. He says it is one of the best things he has ever done. 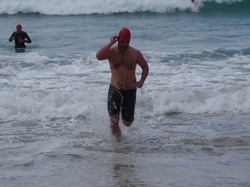 He has competed for the club in open water swimming competition level throughout Western Australia & Queensland in 2010. He plans to compete for the club internationally in 2011 & 2012. Current club record holder for the longest ever underwater Breast start at competition level, Mark is also the current state record holder for devouring the most amount of food after a 5.0km race. With family in Springfield, MA and Austin, TX that have competed in endurance sports ranging from marathon (NYC, Boston etc) to Rowing at College level and modeling for Nike USA Mark comes from a gene pool of endurance ready! The youngest of the three amigos, Mark will enjoy his second trip to the US after visiting Boston & NYC for his 21st birthday, ten years ago. He loves watching the NBA and this season purchased a NBA league pass streaming most games to his plasma at home. Mark is currently in negotiations with Jon and Shaun to convince them going to a Major League Baseball game is a must for any tourist! Jon, Shaun and Mark are arriving in New York on Wednesday 21st September, for the Little Red Lighthouse Swim (24th September). They fly to Las Vegas on Tuesday 27th, for the Slam the Dam Super Slam Race (1st October), departing for San Francisco on Monday 3rd October, and onwards to Los Angeles on Friday 7th October, before arriving back in Perth, Australia on Wednesday 12th October. Phew!